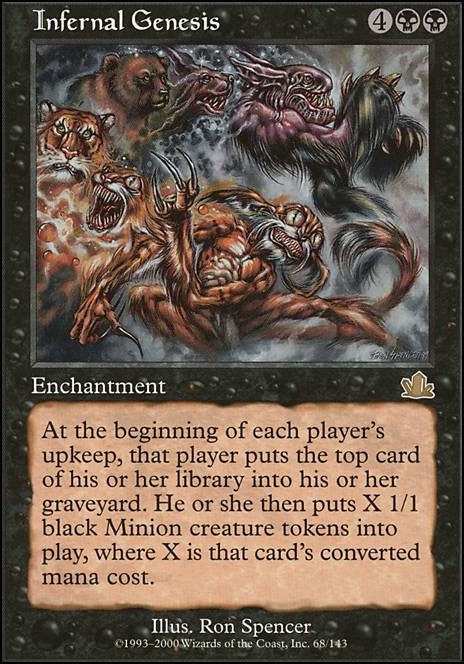 Infernal Genesis so fun, random, & someone always seems to miss the minion-drop & they "eat it"
Very cool; building around Kazarov is on my ever-expanding EDH “To Do” list. Plague Spitter and Ronin Cliffrider are conspicuously absent. Maybe giving your opponents would be worth considering, with things like Genesis Chamber or Infernal Genesis . Your creatures dying punishing your opponents is good but I feel you lack fuel for the stacks approach and your commander in general. 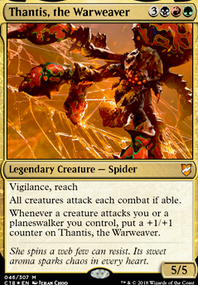 With that in mind I have some token generators that might help with that: Abhorrent Overlord, Evangel of Heliod, Captain of the Watch, Cloudgoat Ranger, Geist-Honored Monk, Ghoulcaller Gisa, Grave Titan, Elspeth, Sun's Champion, Infernal Genesis, Leonin Warleader, Ophiomancer, Pawn of Ulamog, Secure the Wastes, Sengir Autocrat, Skirsdag High Priest. I have tried to choose creatures that were efficient in general and gain value with reanimation. 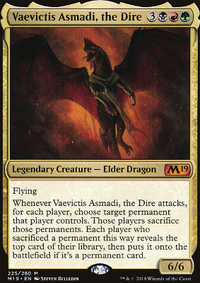 A couple of useful creatures to consider as well: Elenda, the Dusk Rose, Teysa, Orzhov Scion. Neat ideal with the two faced deck. Hey gang, first thread here so please feel free to provide any constructive criticism! Haven't been active in a forum for quite some time..
Anyways, I'm contemplating sort of an odd strategy to utilize Sidar Kondo of Jamuraa as a general. I'm considering Vial Smasher the Fierce or Ludevic, Necro-Alchemist as his partner. Right now it seems like black brings more to the table for this particular strategy and I love b/w removal options but it's possible there are things I've overlooked in blue, and Ludevic insentivizes the kind of thing I'm going for and gives me access to Edric, Spymaster of Trest for total craziness! The main strategy of this deck would be to give my opponents little 1/1 and 2/2 tokens to hit each other with providing evasion with Kondo, maybe turn up the heat with goad and goad-like effects while trying to deter combat damage directed to myself with cards like Ghostly Prison, Sphere of Safety, Crawlspace, Dictate of Erebos, Kazuul, Tyrant of the Cliffs, Mystic Barrier. You get the picture! 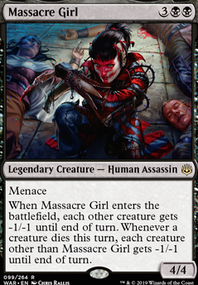 Mob Rule, Insurrection, Army of the Damned and Massacre Wurm are possible win conditions and Overseer of the Damned, Blood Artist, Soul Warden, Vicious Shadows, and Revel in Riches benefit from a carnage of etb and death triggers. 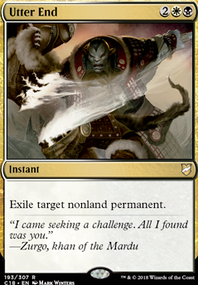 I can also benefit from the Commander 2017 curses so that's something to consider as well! What I feel I need the most help with is cards that put tokens into the battlefield under an opponent(s) control. They're definitely a corner case and it's not entirely easy to do a search for them either seeing how the wording varies quite a bit for cards that do this! I'd also love to hear some interesting synergies if someone comes up with any! This will definitely be a casual deck so no suggestion is too outside of the box, please feel free! P.S. ooooooh! I just discovered Mogg Infestation!! MagicalHacker This is my public brew, however I do have a more updated private brew I may upload and share with you. To point out some things that I found to be ineffective in this variant and were replaced: Infernal Genesis, Cruel Entertainment (I actually swapped Eye of the Storm in for this one; I loaded up a bunch of blue's most broken draw spells, and control tends to leave the Eye alone for a while if they can abuse it for free cards), Child of Alara became my commander because the mana base combined with Child sends "Damnit, that has to be Boonweaver" through the heads of most serious players online during the opening stage of play, which allows me to get a few free chaos plays through while they try to figure out what line of play I could possibly be pursuing. I won't go into detail here for the other swaps, but suffice to say the next variant included far more draw and blue wheels (Chaos, as I play it, wants players to have options; I won't intentionally prevent the game from ending, but I'm definitely trying to make it long and... eventful, plus the blue draw I included was largely intended to allow me to further optimize my deck, swapping tutors for less effective cards). cklise on Tokens for everyone!!!! 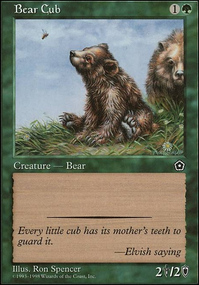 Here is a fairly exhaustive accounting of cards that create small tokens for your opponents that haven't already been mentioned: Benevolent Offering, Dovescape, Mercy Killing, Alliance of Arms, Dark Salvation, Greener Pastures, Infernal Genesis, Tombstone Stairwell, Akroan Horse, Forbidden Orchard. Some are easier than others to control.